In 2017, the first 3DEXPERIENCE on Wheels initiative by Dassault Systèmes received widespread acclaim and a truly overwhelming response from its core audience. Inspired by this wave of popular acceptance, we organized the event’s second chapter in May 2018, in Pune. 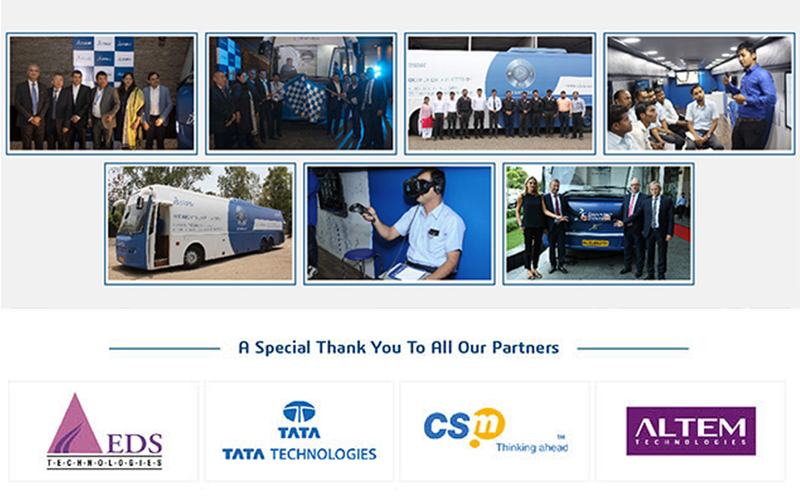 3DEXPERIENCE on Wheels was envisioned as a mobile kiosk/experiential center for small and medium enterprises (SMEs) and other industrial hubs spread across Tier II cities, where we showcased our flagship 3DEXPERIENCE platform. The platform was created to offer end-to-end engineering, manufacturing, and business support, helping SMEs improve process efficiency, reduce costs, and shrink accumulated wastes — by evaluating and assessing data extracted from their core operations. 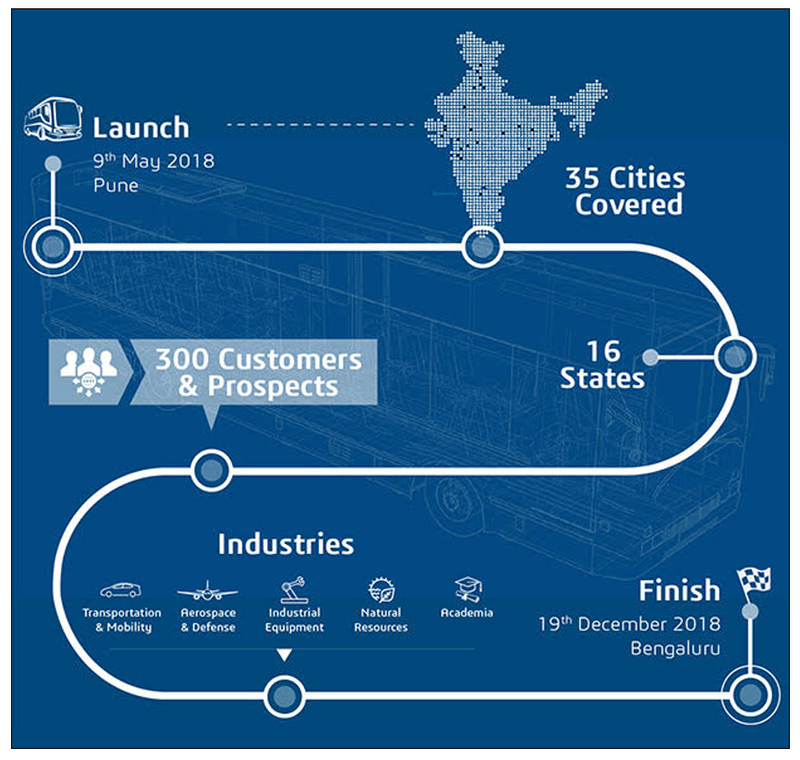 The 2018 edition of the 3DEXPERIENCE On Wheels programme was designed as an ‘innovative lounge’, traveling through 35 cities in 16 Indian states, endeavoring to collaborate with 300+ companies within a timeframe of six months. The lounge was equipped to exhibit the innovations in manufacturing technologies, covering the states of Maharashtra, Gujarat, Rajasthan, Punjab, Haryana, Delhi NCR, Uttar Pradesh, Madhya Pradesh, Chhattisgarh, Jharkhand, West Bengal, Odisha, Andhra Pradesh, Telangana, Karnataka, and Tamil Nadu. The key technologies on display featured a wide array of state-of-the-art solutions and platforms, such as 3DEXPERIENCE Platform, CATIA on Cloud, Social Collaboration Services, and Additive Manufacturing across industries (namely, transportation & mobility, aerospace & defense, industrial equipment, natural resources etc.). The 3DEXPERIENCE on Wheels campaign was structured around the need for discussion and dialogue on future tech-trends, with a focus on experience management, safety, durability, comfort, sustainability, green mobility, and emissions mitigation. We would like to thank all our stakeholders for participating in this unique and vibrant initiative, and we look forward to coming back with the 2019 chapter of the 3DEXPERIENCE on Wheels campaign.